Talk about space on your social media accounts. (This is the easiest way.) Share links to cool space images and articles and encourage you friends and followers to do the same! [Learn how easily you can use social media to inspire people to support the space industry.] This will expose your friends and followers to the wonders and benefits of space exploration - sometimes that's all it takes! Spreading the word about the list is huge. The more people that know about it the more incentive there will be for celebrities to support the space industry and get on the list. 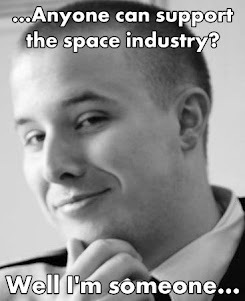 Everybody knows someone that knows someone who can help to publicize the need to increase celebrity support of the space industry. And even if you don't you can impress on other people how important it is and start a chain that will eventually get the message to someone with a connection! Write a small piece for your local paper about why the space industry is so important! Because local papers rarely feature space articles you will be reaching an entirely different demographic than most space articles! Send letters to politicians telling them that you care about the space industry and outlining why they should too! If more people do this politicians will see that their constituents truly care about the space industry and they should fight for it. Participate in public forums and ask questions about space - If a celebrity or organization is taking public questions then ask some about space! A lot of times different celebrities and organizations take time to interact with their fans and followers over Twitter, Reddit, or some other public forum. Encouraging them to show support for the space industry could get them talking about it! Hold a space-related event at your house and invite people over! If there is a big launch coming up you could just invite some friends over to watch it on TV. During an eclipse you could have a barbeque or outdoor party. It's a reason to get all your friends together and have a good time while showing them how cool space is. I know I'll probably do throw a party when the Mars Science Laboratory touches down in August! If you have kids, teach them to love space! If you show them how beneficial and amazing space exploration is you could inspire them to study the sciences and go into a space-related field later in life! Doing any or all of these things will expose people to space that otherwise might not have been. Oftentimes people aren't interested in space because they haven't seen how amazing it is. The more people interested in space, the more people will support the space industry. YOU can help make space a part of people's lives again! If we do that, we'll see space put back at the top of the agenda again!